"Be Here Now" was the first British single from the album. It was released on limited edition 7" vinyl (limited to 500 copies only) on June 18, 2007 to coincide with the release of the album there. The B-side is a previously unreleased live version of "Be Here Now." It is also featured in the trailer for the 2006 motion picture Away from Her. Ray met Luke Farmer in 1999, who co-produced the track 'Barfly' off his 'Til the sun turns black' album. Raymond Charles "Ray" LaMontagne () (born June 18, 1973) is an American singer-songwriter. Reportedly, after hearing a Stephen Stills song, LaMontagne decided to quit his job and pursue a career in music. He has since released four studio albums, Trouble, Till the Sun Turns Black, Gossip in the Grain and God Willin' and the Creek Don't Rise. In the UK, Trouble was a top 5 hit, and the title track of the album was a top 25 hit. Till the Sun Turns Black was a top 40 hit in the U.S. A soft-spoken person who is known for his raspy voice, LaMontagne has won a number of awards for his music and has performed at several charity events. Ray LaMontagne was born in Nashua, New Hampshire, in 1973 to a constantly traveling mother and a violent musician father who abandoned the family during Ray's childhood. Because of his father's background in music, LaMontagne refrained from most musical activity, instead spending much of his time reading fantasy novels in the forest. After graduation, LaMontagne moved away from his family, ending up in Lewiston, Maine, where he found a job working in a shoe factory. One morning at 4 a.m., LaMontagne heard Stephen Stills' song "Treetop Flyer" on the radio as it awoke him for his job. After purchasing the Stills Alone album, he decided that he wanted to quit his job and start a career as a singer-songwriter. LaMontagne began touring in 1999, although he maintained a side job as a tutor. In the summer of 1999, LaMontagne amassed 10 songs for a demo that he sent to various local music venues. Mike Miclon the owner of Buckfield, Maine's Oddfellow Theater heard the demo and invited him to open for folk acts such as John Gorka and Jonathan Edwards. A friend and business executive heard LaMontagne's recordings and introduced him to Jamie Ceretta of Chrysalis Music Publishing. CMP recorded his first album, and sold it to RCA Records in the US and Echo Records in the UK. In 2008, LaMontagne moved into a farmhouse in rural western Maine with his wife, Sarah, and two children, Tobias and Sebastian. In a period of two weeks, LaMontagne re-recorded Trouble at Sunset Sound in Los Angeles, California with producer Ethan Johns. RCA Records released the album on September 14, 2004. The album featured performances by Nickel Creek violinist Sara Watkins on two tracks, along with Alex Davids and Stephen Stills's daughter, Jennifer Stills, on another.See Trouble album liner notes. In the US, the album reached a low peak of #189 on the Billboard 200, but sold over 250,000 copies. Last accessed October 15, 2006 Trouble has sold over 500,000 copies worldwide. During a tour to promote the album, LaMontagne played six songs for an episode of Austin City Limits, in Season 31, 2005-2006. On the third week of finals in the fifth season of American Idol, eventual winner Taylor Hicks performed "Trouble". Chris Sligh, an American Idol Season 6 Top-12 finalist, also performed the tune to rave reviews from the judges. During the ninth season of the show, contestant Alex Lambert also performed LaMontagne's "Trouble". An EP of LaMontagne's performance at the Bonnaroo Music Festival was released on December 6, 2005. "Trouble" and "Burn" have been used as background music for the TV. "All the Wild Horses" was used in the TV series Rescue Me and the 2009 film The Boys Are Back. "Trouble" was used in the TV series Alias, in season 4, 14Âº episode called 'Nightingale'. The song "Jolene" was used in the 2010 film "The Town." 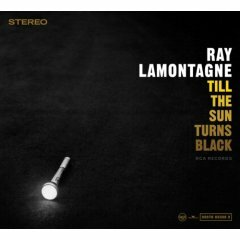 LaMontagne's second album, Till the Sun Turns Black, was released August 29, 2006, in the US. Also produced by Ethan Johns, the album featured more instrumentation than Trouble, including the use of a horn section and string section on several of the songs. Singer-songwriter Rachael Yamagata provided background vocals on the song "Barfly".See Till the Sun Turns Black album liner notes. The album peaked at #28 on the Billboard 200 album chart, selling 28,000 copies in its first week of release. Last accessed October 9, 2006 The album also sold enough copies to be a top three heatseeker album in New Zealand. According to his website, the first single from the album was "Three More Days". LaMontagne performed on The Tonight Show on October 6, 2006, to promote the album. His song "Till the Sun Turns Black" was featured on the television show "ER", Last accessed October 10, 2006 and his songs "Lesson Learned" and "Within You" have been used on the CW drama "One Tree Hill". "Be Here Now" was also used in the official trailer for Away From Her, and was featured in 27 Dresses and an episode of Bones as well as in the first season's finale of Covert Affairs. "Empty" was used in the last episode of Law & Order: Criminal Intents 6th season, "Renewal." Ray LaMontagne recorded a live session at Abbey Road Studios for Live from Abbey Road in October 2006. He shared his episode with Shawn Colvin, Nerina Pallot and The Zutons. LaMontagne released his third studio album, Gossip in the Grain, on October 14, 2008 on RCA Records, and it achieved his highest-ever debut on the Billboard Charts at #3, with over 60,000 units sold. Working again with producer Ethan Johns, the album also featured LaMontagne's touring band: Jennifer Condos on bass, Eric Heywood on guitar, and Ethan Johns on drums. The opening act on much of his 2008 US Tour, fellow singer/songwriter Leona Naess, guests on three songs: "I Still Care for You", "A Falling Through", and "Gossip in the Grain".Hasty, Katie (June 3, 2008). "" Billboard. Retrieved on June 4, 2008. LaMontagne also announced a series of New England dates to start off his US tour in support of the album. The song "You Are the Best Thing" was featured in the movie I Love You, Man. He also performed the song live as musical guest on NBC's Saturday Night Live on March 7, 2009. On October 12, 2009 the song "Sarah" appeared towards the end of an episode of House called "Instant Karma" (Season 6 Episode 4). "Let it be Me" was featured on the Parenthood TV series and included on the Parenthood soundtrack in 2010. LaMontagne's fourth studio album, God Willin' and the Creek Don't Rise, was released on August 17, 2010. The record is credited to â€œRay LaMontagne and the Pariah Dogsâ€�. This is the first time that LaMontagne has released music in collaboration with other artists, within the context of a band, and is also his first venture into the role of producer. With this album, LaMontagne received his first three Grammy nominations on December 1, 2010, including Song of the Year for "Beg Steal or Borrow", Best Contemporary Folk Album, and Best Engineered Album, Non-Classical. Eventually, he won the award for Best Contemporary Folk Album. LaMontagne is particularly known for his raspy voice, which he says he learned by singing through his gut and not his nose. LaMontagne stated that he is highly influenced by Stephen Stills, Richard Manuel, and Rick Danko. Critics have compared LaMontagne's music to that of The Band, Van Morrison, Nick Drake, and Tim Buckley. LaMontagne refers to himself as a "very private person", and rarely gives interviews. He also usually does not interact much with the audience between songs during his live shows and has been known to perform in the dark to avoid distracting bright lights and to separate himself from the audience because of his shy nature. Much of this has changed as his music career has progressed and he has become more accustomed to doing interviews. In 2005, he performed at "From the Big Apple to the Big Easy", a fundraiser for the victims of Hurricane Katrina. The concert was held at the Radio City Music Hall on September 20, 2005, and also featured Dave Matthews, John Mayer, and Simon & Garfunkel among others. Last accessed October 15, 2006 LaMontagne also played at the "Warren Haynes Christmas Jam" that year on December 17, 2005. The concert raised funds for Habitat for Humanity in Asheville, North Carolina. Last accessed October 15, 2005 LaMontagne performed at KYSR's Lounge for Life charity concert on October 5, 2006 at the House of Blues in West Hollywood, California. He also auctioned off one of his guitars on eBay for its charity auction. Funds raised from the concert and auction went to breast cancer research. Last accessed October 24, 2006. Recently in August 2010, he performed with David Gray and Samuel Ofosu in Nashville, TN, and giving a portion of the proceeds to the victims affected by the devastating flood that hit Nashville, TN in May. The money went to Habitat for Humanity in the aid of rebuilding homes destroyed by the flood.